For my classification, I use several algorithms available in WEKA, but with limited number of features. I got some accuracy levels with the algorithms I used and I tried improving the accuracies using Ensemble methods. I used Boosting and Bagging for that. But the outcome I got is strange. Following figures show, the accuracies I got with and without bagging and boosting. Difference of accuracy level with and without Boosting. Difference of accuracy with and without Bagging. 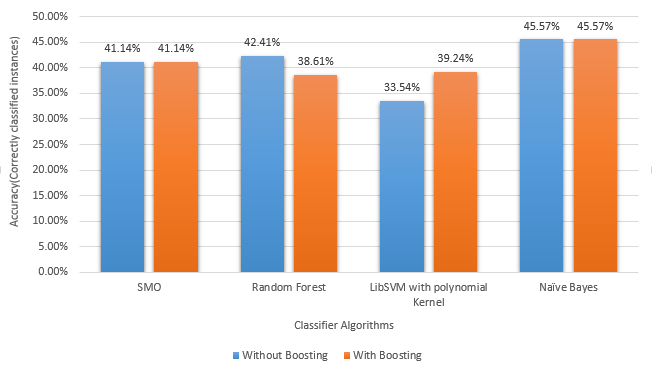 when I used Random Forest algorithm with boosting, the accuracy has been decreased. I can understand that why accuracies do not get improved. But I do not know why they get decreased. In bagging, both Random forest and Naive Bayed have shown unexpected behaviors. I did all these experiments in WEKA. I need to know why this happens? And also do they happen since I have a limited amount of features for my classification? Browse other questions tagged classification weka ensemble bagging adaboost or ask your own question. 30% difference on accuracy between cross-validation and testing with a test set in weka? is it normal? How much higher accuracy of train than test is enough to consider the model overfitted?